Nexwave Review 2019: Is Nexwave a Good Hosting? If you’re a small business in the province of Québec in Canada looking for another small business to provide you with the hosting and advertising services you need, Nexwave is a decent option with straightforward shared web and VPS hosting services. Nexwave was born in 2010 after a merger between a tech startup and a Montreal-based web hosting company. For Nexwave, the shift to include web hosting as part of their internet marketing services for small businesses was the natural next step in their company’s evolution. They also offer website management and website advertising services on top of their other two core business functions. With servers in Montreal, Nexwave is still very much invested in the success of local businesses located in Québec. More tech-savvy Canadian customers will also be happy to learn that Nexwave supports the most popular scripting languages, such as PHP, MySQL, Ruby, Ruby on Rails, Perl, and Python. However, they don’t offer much more than that in the way of special features or services. It’s true that with cPanel and their pre-packaged CMS support, you don’t really need much else to start setting up and managing your website. However, beginners without a lot of website building experience might want a more tailored setup. On the other hand, some people, like me, enjoy the freedom of a clean slate when it comes to your hosting without any bloatware or unwanted software. It all comes down to taste. If you really need help managing a server, their VPS plan with an add-on No-Hassle hosting service is your best way forward. WHMCS is also a must-have tool for resellers to help you set up a ticket system, bill clients, and fulfill new orders. I found it refreshing to come across a no-hassle hosting provider in Nexwave. With just shared and VPS hosting, their pricing structures are very straightforward. All their plans come with a free domain name (.ca, .biz, .co, .com, .org, .net, .info, or .us). They don’t offer any money back guarantees or free trial periods though. That said, the prices at Nexwave are a bit expensive considering the relatively low resource limits. While they offer unlimited add-on domains with all their packages, you likely won’t be able to host more than a couple websites on all but their highest-tier Corporate Web Hosting plan. It’s a shame that Nexwave only provides support via a ticket system. This will feel unnecessarily restrictive to users who like the immediacy of a phone call or live chat. Their knowledge base also seems to be empty, which means you’ll need to search elsewhere if you’re stuck and want to solve the web hosting problems yourself. However, it’s good news that VPS customers that need it can purchase a fully-managed service for a hands-off hosting solution. For straightforward shared or VPS hosting with comprehensive server management options, Nexwave is definitely worth a look, especially if you’re based in Québec or serve customers there. However, the limited resources and support means it’s not for everyone. 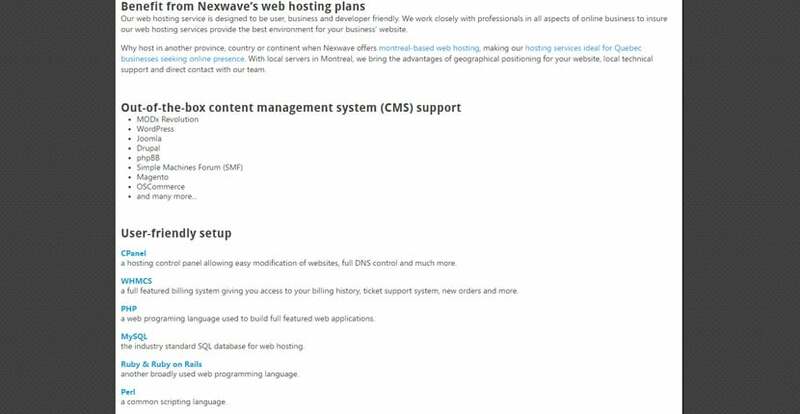 Wondering how Nexwave stacks up against other Web Hosting companies? Enter any other Web Hosting company and we will give you a side-by-side comparison.